As the tourist ship M/S Explorer flounders in Antarctica, people have been explaining why such expeditions are becoming extremely popular. When people book a holiday, they most commonly choose somewhere that is warm and exotic. But trips to the frozen extremes of the Earth are becoming increasingly popular. 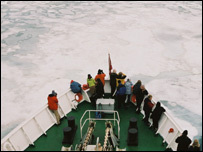 According to the International Association of Antarctica Tour Operators, about 37,552 tourists visited in Antarctica during 2006-07 by air, sea, on land or via a cruise. These were ferried by about 60 ships operated by some 40 companies. It is the very isolation and desolation of the Arctic and Antarctic that is the draw for those seeking an experience far removed from the ease and comfort of a typical package holiday. Gavin Barker, 29, from Bradford, West Yorkshire, took a 12-day trip on the M/S Explorer to the Arctic in June and July last year. He described the experience as an "education and an adventure" and even used the wild and dramatic landscape as a backdrop to propose to his 35-year-old partner Hege. Mr Barker, who has since married Hege, said: "Sitting on a beach has been and gone. A trip like this is rewarding, educational and helps to make a difference. "You use the life boats on the side of the ship, called zodiacs, to get on the ice during expeditions. 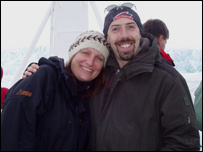 "You get close to polar bears, and I stood 10 metres from a group of 30 walruses. 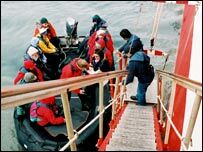 "The group contained marine biologists, arctic biologists and it's very much an eco-trip. You don't just rock up and take photographs, you get involved, helping to do things like clean debris on the beaches that floats in from Russia." Mr Barker said the trip's motto was "Leave nothing but footprints behind", which he said was quite appealing. He also said the expedition was very well run and he felt safe whether he was on board the Explorer or taking a trip on the ice. "We had a safety briefing before we left the dock, and were given an outline of the vessel - which absolutely everyone referred to as 'the little red ship' - along with what to do and where to go. "Then there was a mini-drill within the first hour. When we were on a zodiac, some 20 metres from a polar bear that was on an ice island, there were rangers with guns with us - although it is illegal to shoot a polar bear." Mr Barker said the group tourists were of a mixed age, and he and his partner were "among the youngest", with several older people making up the party. According to Tom Hall, travel editor of the Lonely Planet, such trips are more popular with the 50-plus generation, mostly because of the costs involved. He said: "Older people have the disposable income and the time to spend on taking trips to the Arctic and Antarctic. "A trip to the Antarctic from the UK will cost between £5,000 and £7,000. "People are becoming more intrepidly adventurous, and more willing to spend more on a dream destination. "Thailand and Australia might have been wild and exotic 20 years ago, but now everybody's been there." As for the safety aspect Mr Hall says there are "far worse places in the world to sink if you are on a cruise ship", claiming it was riskier to get on a ferry in the Philippines than undergoing a trip to the frozen extremes of the Antarctic. He said: "Antarctica has an excellent reputation for safety, and there are often other ships not that far away to lend assistance, as was the case with the Explorer. "You do have to be careful when on board such ships, as they can lurch suddenly, but there are hand rails everywhere. "Bobbing up and down in a small boat in the Antarctic Ocean would not have been a pleasant experience for the Explorer's evacuated passengers, but they would have been well drilled, known what they were doing and been wearing lifejackets.